Breakfast cookies have been showing up lately as a quick make-ahead option. 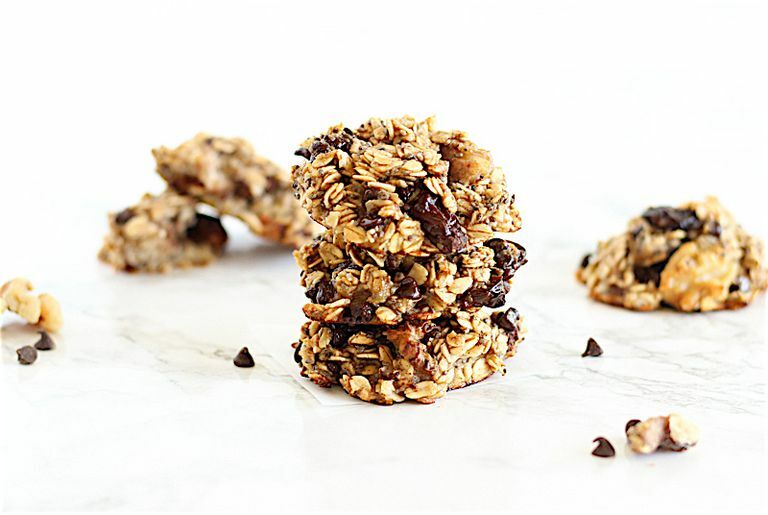 Some are healthier than others, but they typically include nutritious ingredients like oats, nuts, and bananas that set them apart from regular cookies. These cookies are flourless and naturally sweetened with bananas and a touch of maple syrup. Oats, chia seeds, and raisins provide fiber and texture, and the walnuts and egg provide a bit of protein. They also have healthy fat thanks to the nuts and chia seeds. All of that nutrition adds up to a filling breakfast that is easy to eat on the go. Heat the oven to 350F. Line a baking sheet with parchment or a silicone baking mat. In a large bowl, combine oats, chia seeds, cinnamon, walnuts, raisins, and chocolate chips. Mash the bananas and whisk with egg, almond milk, maple syrup, and vanilla. Pour the mixture into the dry ingredients and stir to combine. Scoop by heaping tablespoons onto the prepared cookie sheet and flatten slightly. Bake 15 to 20 minutes. Cool for 5 to 10 minutes on the baking sheet before removing to a cooling rack to cool completely. Store in an airtight container in the refrigerator and reheat as needed. Use any unsweetened dried fruit or unsalted nuts that you like, in place of raisins and walnuts. You can use honey or agave nectar in place of maple syrup. Cookies will not spread since they have no butter or oil. Flatten them slightly before baking. Reheat cookies for 15 to 20 seconds in the microwave before heating, if you wish. If you want to pump up the protein even more, you can enjoy a container of Greek yogurt or a boiled egg alongside the cookies. Grab a piece of fruit, too, and you'll have a rounded breakfast that will keep you full and energized for hours!